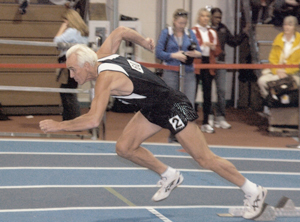 Peter is one of the most accomplished and prolific competitors in world masters athletics. Peter has consecutively made it to a final at every State, National, World Outdoors and Indoors events in all three sprints in which he has competed for more than 20 years, a rare display of sprinting longevity and depth. Born in Sydney on 25 December, 1944 he showed early promise as an athlete prior to commencing regular competition in 1960 at age 15 and has since competed for 50 consecutive years. His first World Championships as a master was in 1987 in Melbourne where he won 3 gold medals and reached all 5 finals, something he has regularly achieved at World Titles. Since then he has gone on to win more than 80 national titles over all sprint distances including throws and jumps. At World level Peter has proved to be one of the most enduring athletes of all time winning 34 sprint medals at the World Outdoors and 11 at the World Indoors, likely more than anyone at his age in the history of the sport. In addition Peter fulfils many administrative functions from local to international level and coaches a large masters sprint squad – a number of which have gone on to win national and world titles. In 2009 Peter had a major knee operation and was told by his doctors that he would never compete again. With his never say die attitude he overcame that difficulty to come back and win multiple sprint gold medals in the recent World Indoors in Kamloops as well as the 2010 US National Titles. In the US he beat the current US Indoor and Outdoor M65 sprint world record holders over the 100 metres and 200 metres both in a National record. In each of these recent meets Peter further demonstrated his sprinting prowess when his winning 200 metre time was faster than the younger age group! It is pleasing to see Peter back in good health.